Today is Candlemas, more commonly referred to as the Feast of the Presentation of Christ in the Temple, or the Purification of the Blessed Virgin. This feast is one of the oldest on record, observed by early Christians since the 4th century A.D. in Jerusalem. Candlemas is always celebrated on February 2nd, forty days after the birth of Christ. According to Mosaic law, a Jewish woman who delivers a male child is considered unclean for seven days following the birth and then housebound for an additional 33 days. After this time period, the mother visits the temple to be purified and present her child to the Lord and the community. Because of this allusion to Christ as the Light of the World, the tradition of blessing candles has been included in the Candlemas liturgy. During the Mass, clergy bless the candles that will be used in the church for the year, and parishioners can bring candles from home to be blessed. Candlemas officially marks the end of the Christmas season, so if the nativity scene is still up, your procrastination is vindicated! 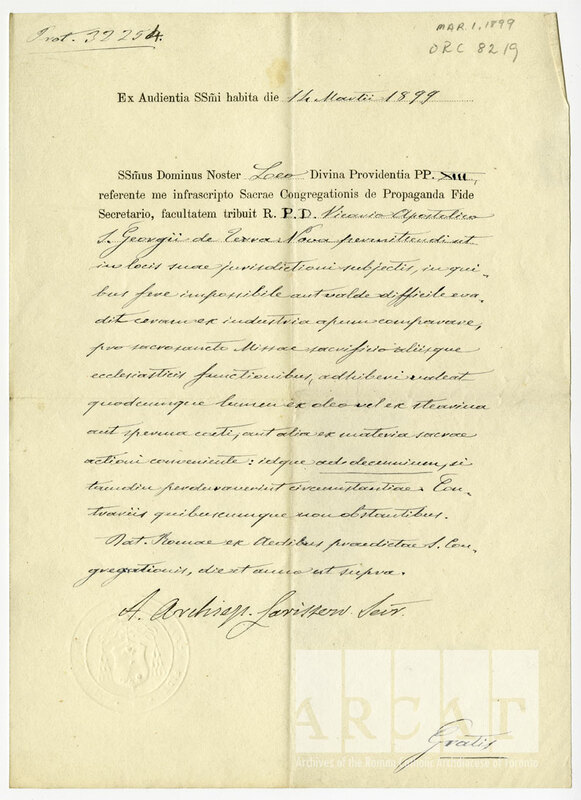 May 24, 1885 - An indult granted to John Lynch, Archbishop of Toronto, by the Sacred Congregation for Propagation of the Faith under Pope Leo XIII transferring the Feast of the Purification of the Blessed Virgin and the blessing of candles to the Sunday following the Feast. The liturgical candles blessed on Candlemas are supposed to be made of beeswax, which is mystically significant. The pure wax produced by bees symbolizes the pure flesh of Christ received from His Virgin Mother. The candles do not have to be of pure beeswax, but a majority percentage is required. The most recent decree of the Congregation of Rites (1904) determined that the paschal candle must be of beeswax in maxima parte, which has been interpreted as at least 75 percent. The percentage is not as high for other liturgical candles. 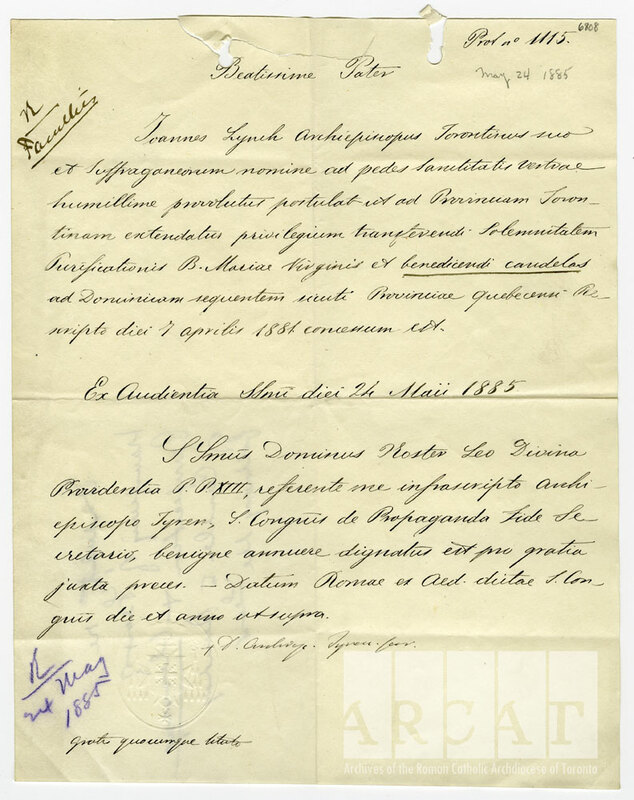 March 14, 1899 - A letter from the Sacred Congregation for Propagation of the Faith granting to Msgr. Neil McNeil, Vicar Apostolic of St. George's, Nfld., the faculty of using oil burning lamps for Holy Mass and other religious services in his jurisdiction since beeswax is not easily obtainable. This special consideration is granted for the duration of ten years. 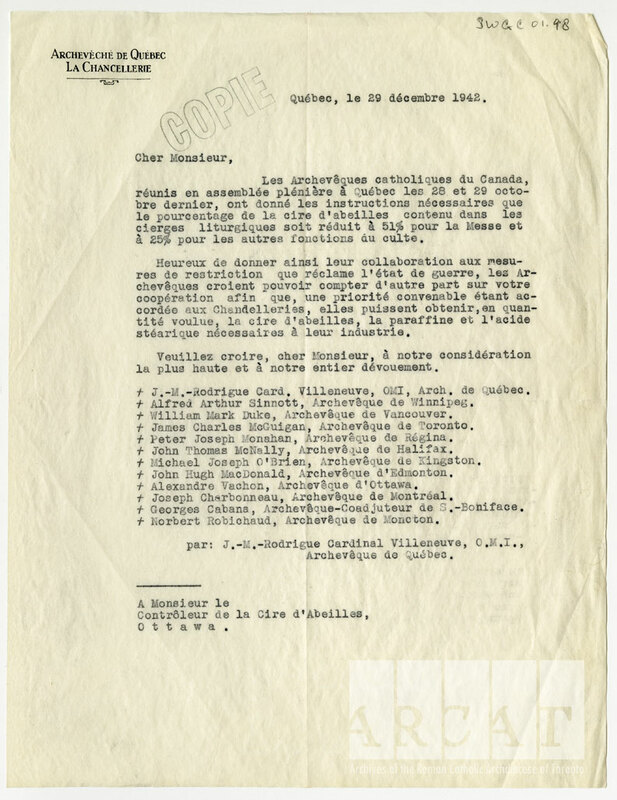 December 19, 1942 - A letter to the Controller of Beeswax, Ottawa, from the plenary assembly of Catholic archbishops of Canada informing him that the percentage of beeswax required for liturgical candles is reduced to 51% for Mass candles and 25% for other functions of worship, in cooperation with the imposed war restrictions. In German-speaking areas, prognostication was left to the fauna. A sunny Candlemas meant that the local badger would see its shadow, foreboding a longer winter. This tradition was brought to North America by the Pennsylvania Dutch, who substituted the European badger with the local groundhog. So today, grab your beeswax candles and check out Wiarton Willie's predictions for spring in Ontario.